not the last - but with only one last fall and two the previous year, our expectations are low. Notes: Our unusually productive week 5 seems to have been a sign of things to come, as we had our busiest ever week 6, with the birds giving a hearty welcome to our new bander for the remainder of the 2008 fall season, James Junda! He hails from the mountains of Colorado and has spent the last several years working with birds, including migration monitoring in New Brunswick, summer MAPS in Indiana, and banding both our migrants and exotic species during a winter in Jamaica. We are very fortunate to have James with us on the MBO team! He claims to be a lucky bander, and his first three days on the job at MBO seemed to support that - more birds were banded during that short period than in the entire week 6 in two of our previous three fall seasons! In the end, the weekly total was nearly 25% better than our previous best for this time of year (in 2006). The high point of the week, in many ways, was Sunday. We banded 81 birds that day, our highest total so far this year, and with another 20 repeats also broke the 100-bird barrier ... something we expect to see a few more times in the coming weeks if the kinglets, White-throated Sparrows, and Yellow-rumped Warblers show up in good numbers. By happy coincidence, Sunday was the morning dedicated to our annual MBO identification and moult workshop, so participants were treated to a great number of examples to reinforce the lessons from the Saturday afternoon classroom session. Better yet, the diversity of birds in the nets was exceptional that day - in fact, it marked the first time ever at MBO that we banded 30 different species in a day! 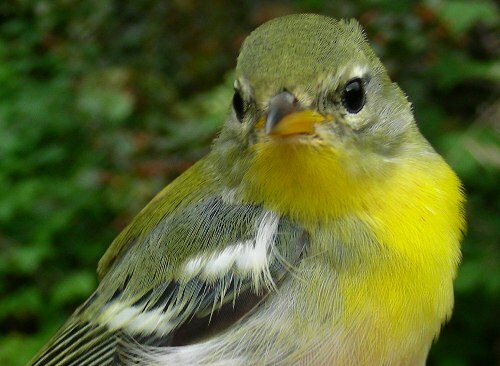 Among those were 16 warblers, and also for the first time at MBO, we banded all 4 vireo species in the same day (well, at least all of those we've ever seen here - we eagerly await the arrival of a Yellow-throated or White-eyed). As if all our luck at the nets wasn't enough, Sunday also marked the discovery of species #196 for our all-time checklist, and it was a remarkable one at that - a wayward juvenile Northern Gannet flying south over MBO! As great as Sunday was, most other days this week also proved memorable. Prior to the new record of 30 species banded in a day set on Sunday, Friday was our most diverse day since 2005, with 25 species banded. Overall, our 43 species banded for the week nearly matched last week's 44, which we noted as being especially high. For three days running we banded over 20 Magnolia Warblers each morning ... by Monday they had tapered off a bit, but another surge came through on Wednesday, helping push the weekly total to over 100 of them. 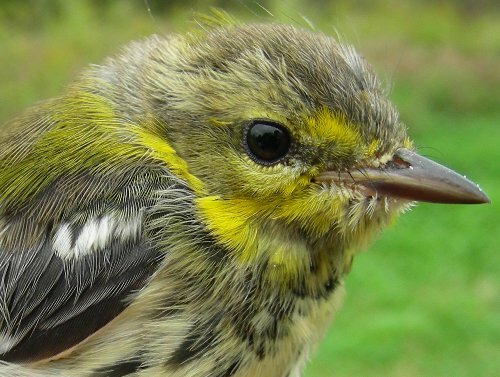 That means that just in the last two weeks alone, we've banded more Magnolia Warblers than in all but one of our previous full seasons (and the record of 192 from fall 2005 has also fallen by now, considering those we banded earlier this fall). We won't do a thorough search for new season records until we get to the end of October, but already halfway through this season we know we've banded record numbers of several other warblers, including Blackpoll, Mourning, Canada, Wilson's, and American Redstart. It appears to have been a great year for breeding in the eastern boreal forest, and we hope that the later fall migrants will have been similarly successful. For the season, the number of species observed and banded remain just marginally ahead of our normal pace. However, the total number of individuals banded continues on a record pace, over 50% more than last year, and more than 100 individuals ahead of 2006. Nashville Warblers haven't been nearly as abundant as Magnolia Warblers this year, but did put on a good showing this week. While we've been overwhelmingly banding hatch-year birds, this after-hatch-year male with his bold white eye-ring and significant patch of rust-coloured crown feathers provided a nice contrast to the younger birds. Magnolia Warbler remained on top of the list of birds banded for an unprecedented third week in a row, once again increasing in numbers and widening the gap between first and second place. Thanks perhaps in part to the continuing warm weather, week 6 remained dominated by warblers, including the 5 most frequently banded species, and 8 of the top 11. White-throated and Song Sparrows tend to increase around mid-September, and both started making their presence known this week. The other species in this week's list was Red-eyed Vireo, largely on the strength of a flock of 7 that hit the last of the B nets at closing time on Friday. This week's list of most frequently observed species features the same cast of characters as last week. The waxwing influx was most noticeable on Monday, when at least 100 of them were milling about, though we managed to get only a couple of youngsters in the nets. The rest of the list shuffled a bit from last week, with crows moving back up to the top as the grackle flocks tapered off a bit. They will likely build again as we head toward late fall, as will the Canada Goose numbers. The position of Magnolia Warbler might be expected to be higher, considering how many we banded, but many days we saw hardly any other than the ones we found in the nets - either they were all very eager to get a bit of new jewelry, or just awfully secretive (though admittedly on the busiest days, we could have used a couple of extra pairs of eyes to keep up with observations outside). Although many of the warblers were observed in relatively low numbers, we counted an average of close to 15 species per day this week, an impressive number for anywhere in southern Quebec at this time of year. 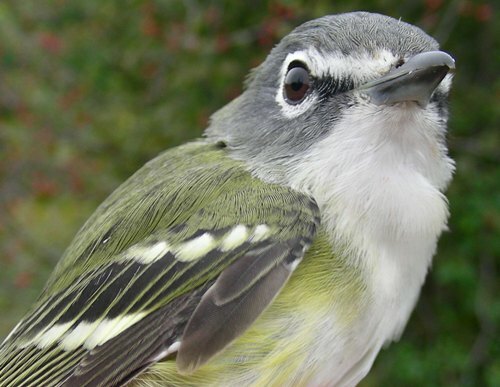 This Blue-headed Vireo was our fourth species of vireo banded on this week's very busy Sunday, and also was the first of its kind banded at MBO this fall. 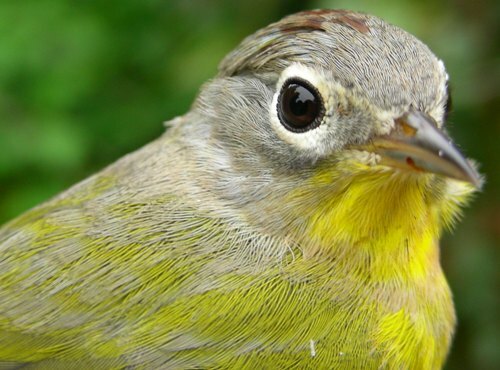 This warbler highlights the importance of looking at all of the key field marks. The overall impression pointed several observers toward Cape May Warbler at first - but others astutely noted that the bill was somewhat too thick, and there was too much black on the upper breast. 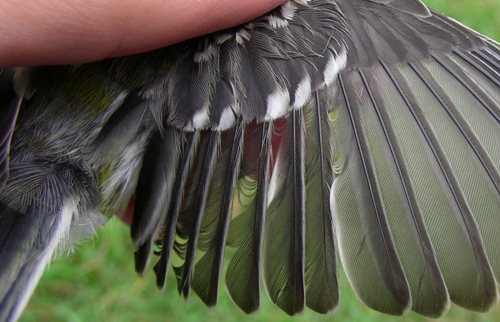 But most significantly, the rump (as shown in the photo below) is grayish-green, whereas Cape May Warblers have distinctly yellow rumps.